Winston Churchill liked pigs. "Dogs look up to us" he explained. "Cats look down on us. Pigs treat us as equals". I wonder what he would have made of the decision by judges of a school award to disqualify an educational CD Rom retelling the tale of the Three Little Pigs on the grounds that it "might offend Muslims"? Ridiculous? Absurd over-sensitivity? Another own-goal by the self-abasing multiculturalists? Of course. But then, we've been here before. In 2005, staff at Dudley city council were banned from taking to work any pig-related trinkets after Muslim councillor Mahbubur Rahman apparently complained. You can't blame him for trying, I suppose. He described the ban as "a good thing, it is a tolerance and acceptance of their beliefs and understanding". Also in 2005, it was reported that branches of Halifax and NatWest banks were banning the open display of piggy banks. Recently I have been aware of an occasion where young Muslim children in class were read stories about pigs. We try to be sensitive to the fact that for Muslims talk of pigs is offensive. Commenting on that particular incident, Inayat Bunglawala of the MCB dismissed the idea that Muslims would actually be offended by such stories. "There is absolutely no scriptural authority for this view. It is a misunderstanding of the Koranic instruction that Muslims may not eat pork." And indeed, councillor Rahman apart, it's difficult to discover any Muslim who has ever demanded images of pigs be removed or pig-related stories banned. As sensible Muslims are well aware, such tales only serve to damage community relations, as well as playing into negative stereotypes of Islam as intolerant, alien and weird. The notion that Muslims are likely to be offended by such items is, in any case, plainly absurd. Just because they aren't supposed to eat pork does not mean that they would be horrified by a cartoon animal, any more than Jews would. 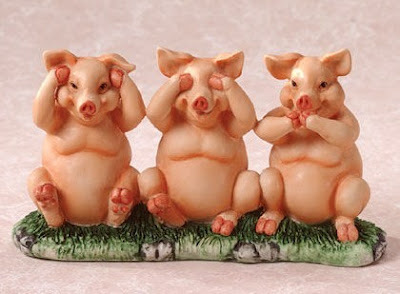 No-one has ever suggested that nursery rhymes about pigs should be suppressed out of deference to Jewish sensibilities. This latest decision, in fact, comes from Becta, the government's educational technology agency, a body the existence of which few people were aware before today. The panel of judges, most of whom are apparently teachers, criticised The Three Little Cowboy Builders on the grounds of "concerns about the Asian community" and claimed that "the use of pigs raises cultural issues". They were also worried that it might alienate builders. Such idiocy is clearly well-intentioned. But it can only be counter productive. As Anne Curtis, the CDRom's designer, said tonight, this type of hypersensitivity must end up by "closing down the minds of our children", and is hardly conducive to building a tolerant, cohesive society. This is so blindingly obvious that I must apologise for boring you by writing it. Yet stories like this keep emerging, so someone hasn't got the message yet. Given the supine reaction of our leaders to anything to do with Islam, and the propensity of the noisier sort of Muslim activist to bring out the "Death to Infidels" banners at the slightest opportunity, it's interesting to speculate what would happen in our society if Muslims really were offended by representations of pigs. There would be no TV broadcasts of the film Babe, or of Porky Pig cartoons, no schools would allow their classes to study Orwell's matchles allegory Animal Farm, Winnie the Pooh would be re-edited to remove references to Piglet. Pork and bacon would be cleared off the shelves of Tesco and Sainsbury's, at least in places where there was a statistically-noticeable Muslim population. Queen's College Oxford would ditch the Boar's Head Carol. Vast swathes of our culture would be expunged. No doubt it would be considered a small price to pay for a quiet life. "...Winnie the Pooh would be re-edited to remove references to Piglet..."
Hi! I found your blog when it was Boingboinged a bit ago, and I've been enjoying it. I absolutely agree with your point that the Qur'an does not necessitate offense at pigs. What's more, no individual Muslim I know would be offended by Piglet, and one even once gave me a pig statue -- as a gift for the Ramadan holiday of Garangao, no less. But that doesn't mean that there aren't groups and forces within Islam that actually would ban Porky and Babe if they could. Astagfurallah.